Show your clients you care with a unique holiday gift. 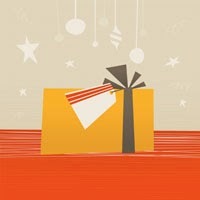 Here are some holiday client gift ideas that will make your company stand out. Everyone has this special work drink (be it coffee, tea, water or whatever). Recognizing this fact and giving a nice, thoughtful gift can go a long way. Just beware selecting anything with too much personality. Opt for neutral colors and shapes with a simple pattern. Practical and affordable, our favorite combination. The letterpressed quality adds a little something extra that they couldn’t pick up at a discount store. If they’re coffee drinkers, this nice gift can be as large or small as you’d like. Perhaps package the gift card in a nice travel thermos. With the holidays upon us, many of your clients will be hosting gatherings. Give them a nice collection of drink ideas (perhaps ask your office employees to contribute their favorite holiday drink and have a book printed and bound) and they’ll think of your company each time they reach for it. Food is always a fantastic option. Look for something unique that you think they’ll find appealing (perhaps a basket of unique olive oils, a collection of local cheeses or a sampling of baked goods from your favorite local bakery). Show off your local winery by ordering a bottle (or case) of regional wine. Just be sure to know if a) your client drinks wine and b) if they prefer red or white. Include some personality in delivering this message if it suits your company’s brand (“We donated the equivalent of four paperweights and two deluxe fruitcakes to Heifer International in your name.”) This philanthropic approach can warm hearts everywhere, and makes your clients look great. Looking for something a little more creative? This gift idea will surely show your appreciation—and it offers them a specialty drink, rather than the black coffee offered in their break room. December brings about great holiday flicks. Rent out a theater room or buy movie passes for their office and send them out for a nice treat.